Me: So besides dance, what are you passionate about? Do you collect anything special? Have any hobbies or obsessions? Me (this is a little trick you, Reader, could try! ): What’s on the walls of your bedroom? Fierce Girl (blushing a bit): I can’t tell you. You wouldn’t believe it…Okay, it’s a giant poster of Edward Cullen. Fierce Girl: Yes, I love him. Don’t tell anyone. I’m really not like that. I’m not mainstream at all. I love all different kinds of alternative music, and all types of literature. I like off-beat and foreign movies. Me (after an epiphany): You know what? I think this could be the perfect topic for you. It’s all how you write it. Start by showing us how you hide this “dirty little secret” of yours, and use that example to also show us how unusual and unique you are in every other way. Of course, you also would need to explore why you are drawn to the Twilight saga, but that could also be interesting. Obviously, there are some universal themes at work. Fierce Girl (tentative at first, but quickly gets where I’m headed with this): I get it. I could start my essay by showing how when a friend comes over, how I pull down the giant poster, sweep off the Twilight books from my shelf and turn off my Edward Cullen screensaver. Then I talk about why I’m embarrassed of this obsession and try to hide it from my friends, but then explain why I’m anything but a mainstream teenage girl. Me: Exactly! And although you don’t want to try to write a “funny” essay (since they usually fall flat), it’s fine if what you are describing happens to be funny. That introduction would be so engaging and entertaining. It’s kind of risky writing about such a cliche topic as Twilight, but it’s all how you do it and what you have to say. What I love about this essay topic is that it will be the perfect foil, or compliment, to her other essay. It shows a whole other side to Fierce Girl–she’s a romantic and, like most of us, a sucker for a great story. And the slightly confessional quality also makes it endearing. So, if you are still looking for a college application essay topic, what’s on your walls? Now you can read Ava’s entire college app essay in Heavenly Essays: 50 Narrative College Application Essays That Worked. 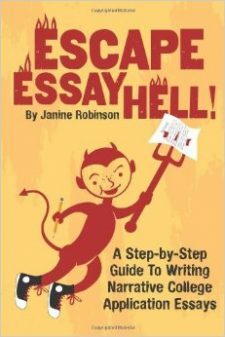 If you want more help finding a unique topic and writing a compelling narrative essay, check out my new ebook guide, Escape Essay Hell!, that walks you through the process step by step.